Did you have any idea that February 5th was World Nutella day?! I just found this out and I couldn’t be happier- A whole day dedicated to Nutella! If I had the time to make pancakes for breakfast every morning I would, they are my favorite! Growing up I used to be superstitious about eating pancakes the morning of all my ski races. New Hampshire Ski Race Circa ? It all started when I ate 12 pancakes before the Francis Piche race in Gunstock New Hampshire- you’d think it might have slowed me down but I ended up winning! Thus began my ritual before all my ski races- Pancakes! With the Sochi Olympics starting tomorrow it only seemed right to post my favorite pancake recipe in support of all the Alpine racers going for Gold in Sochi! I went for “gold” at Mohawk Mountain when I was 10 (above) so these pancakes are obviously the magic elixir (that is not a proven fact). Ok, I doubt elite level athletes are stuffing their faces prior to a race with Nutella pancakes but they are super delicious regardless! I love these buttermilk pancakes because you can dress them up anyway you like- Nutella stuffed, blueberry, raspberry, chocolate chip, banana, even plain is good! You can also substitute whole wheat flour to make them a little more healthy! Don’t forget to top them off with real maple syrup – (not that fake crap from a plastic bottle!) Whether you’re hanging around the house on a lazy Sunday, going out to ski some fresh powder or getting ready for an Olympic Downhill these pancakes will fill you up and give you the boost you need! Good luck to all the Olympic athletes competing in Sochi! I am especially psyched to watch Leanne Smith and Julia Ford (yah New Hampshire girls!) and Park City native Ted Ligety to throw down and ski fast! Mix flour, baking powder, salt and sugar in a large bowl. Mix dry and wet ingredients, stir to combine. Lastly stir in buttermilk. Melt butter in a large skillet or griddle over medium-high heat. Pour batter onto skillet and allow batter to rise (about 1 minute). Place a dollop of Nutella (about 1/2 teaspoon) in the center of the pancake, cover Nutella with a little more batter. If you prefer other toppings add them here- sprinkle pancake with blueberries, chocolate chips or other desired treats! Cook until edges rise and bubbles form on top of the pancake. flip and cook until golden brown on both sides. Serve with butter and maple syrup, Enjoy! 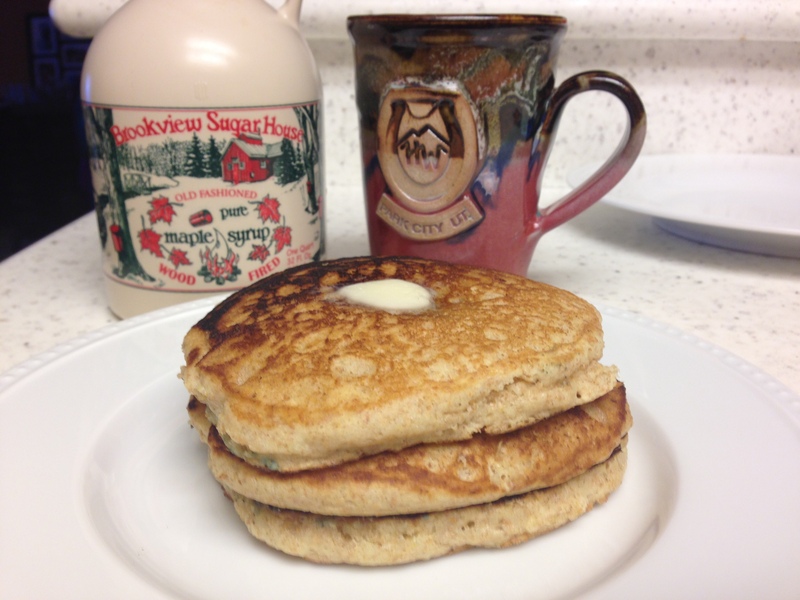 This entry was posted in Breakfast, Recipes and tagged breakfast, buttermilk pancakes, nutella stuffed pancakes, pancakes by skibootsinthekitchen. Bookmark the permalink.